It’s not the easiest thing to do for an undergraduate student — co-authoring a paper accepted for publication in one of the world’s top academic journals. 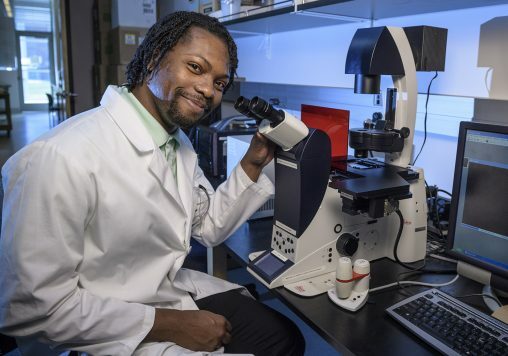 But that’s exactly what Marquise Crosby — a senior in the matrix Department of Biochemistry and Molecular Biology in the College of Science and Mathematics and Boonshoft School of Medicine at Wright State University — has done. Crosby’s research will be part of a paper scheduled for publication in Science, a high-impact, peer-reviewed journal of the American Association for the Advancement of Science. Crosby feels that publication of the paper is a validation of the importance of the research. Crosby wants to keep the specifics of the paper under wraps until it is published. He will only say he was directly involved in expressing a protein mentioned in the paper. The principal investigator in the research and on the paper is Ting Xu, an associate professor in the materials science, engineering and chemistry departments at the University of California-Berkeley. The paper’s other co-authors are Crosby and Patrick B. Dennis, a researcher at the Air Force Research Laboratory at Wright-Patterson Air Force Base who is also an adjunct assistant professor in the Department of Biochemistry and Molecular Biology at Wright State. Crosby works as a lab assistant at Wright-Patterson in the Soft Matter Branch of the Air Force Research Laboratory’s Materials and Manufacturing Directorate. The directorate develops materials, processes and advanced manufacturing technologies for aircraft, spacecraft, missiles, rockets and ground-based systems and their structural, electronic and optical components. Crosby spent his early years in Oakland, California, moving to Dayton when he was 9 or 10. 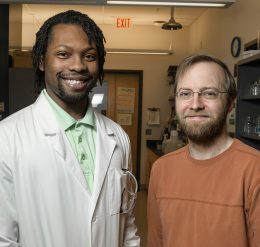 Marquise Crosby and Chad Campbell, instructor in the Department of Biochemistry and Molecular Biology. With the guidance of his mother, Dedra Porter, Crosby spent his high school years at the Ponitz Career Technology Center studying biotechnology. Crosby also spent time in the swimming pool, where he swam competitively and specialized in the butterfly stroke. “It’s the one that came the most natural to me,” he said. After graduating from Ponitz in 2012, he attended Campbellsville University in Kentucky on a swimming scholarship. But when the rigors of swimming began to affect his studies, he transferred to Sinclair College in Dayton. Crosby earned his associate degree in biotechnology at Sinclair and came to Wright State in 2014. He is scheduled to graduate in the fall with a bachelor’s degree in biochemistry and molecular biology. Crosby would like to go on to graduate school, continue to conduct research and eventually teach. “I’m actually really interested in marine biology and immunology, which can be two very different things,” he said.